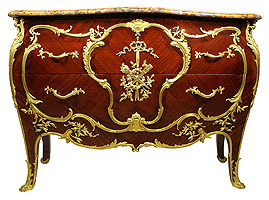 A Very Fine French Belle Époque 19th/20th Century Louis XV Style Superb Quality Ormolu Mounted Kingwood Bombé Commode with a Brêche d'Alep Marble Top, Attributed to François Linke and Mâison Millet. Unsigned. Circa: Paris, 1900. Note: The ormolu on this piece is stamped both "FL" and "EM" on the reverse. 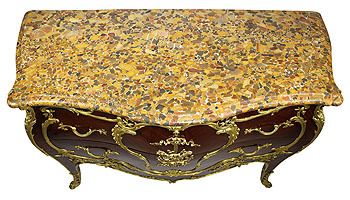 We believe that this commode was most llikely commissioned to Linke by Mâison Millet. François Linke (1855-1946) was undoubtedly the most important Parisian ébéniste of his time. Having served an apprenticeship in his hometown of Pankraz, Bohemia, Linke arrived in Paris in 1875 and set up independent workshops at 170, rue du Faubourg Saint-Antoine in 1881 and later also at 26, Place Vendôme. By the time of the Paris 1900 Exposition Universelle, Linke's worldwide reputation as a master of high individualism and inventiveness was already established and unmatched by his contemporaries. His success at the 1900 Exhibition afforded Linke a high degree of financial stability and allowed him to pursue new markets by exhibiting at subsequent international fairs. Like the inventories of contemporaries such as Beurdeley and Dasson, Linke's oeuvre included copies and adaptations of the distinct styles of 18th century important and royal French furniture. His most extravagant exhibition pieces, however, combined the Louis XV style with the new Art Nouveau style. Linke's frequent collaborator for his designs was the celebrated sculptor Léon Messagé. In 1904, he was made Officier de L'Instruction Publique, and in 1905 he was called to be a member of the Jury of the Liège exhibition. Following his stands in the St. Louis (U.S.A.) exhibition in 1904 and the Liège exhibition in 1905, Linke was decorated with the highest distinction of France, the Croix de la Légion d'Honneur, on October 11, 1906. Mâison Millet was established by Théodore Millet in 1853, and operated until 1902 from premises at 11, Rue Jacques-Coeur, Paris before relocating to 23, Boulevard Beaumarchais. Mâison Millet was a highly regarded furniture firm that was described as producing 'meuble et bronze d'art, genre ancien et moderne.' The company won several awards in the series of exhibitions in London and Paris, such as the gold medal in the 1889 Paris Exposition Universelle, a Grand Prix in 1900 and three further diplomes d'honneur and four médailles d'or for the furniture they produced. The firm specialized in the Louis XV and XVI styles, though they were acclaimed by their contemporaries for working in their own modern style. 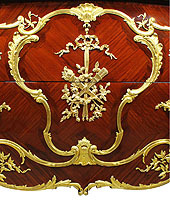 In March 1902, the firm was authorized by the Palais de Versailles to replicate Marie-Antoinette's celebrated Grand cabinet à bijoux. An auction was held in 1906 clearing the remaining stock and the firm finally ceased trading in 1918. Mâison Millet was an active client of François Linke. 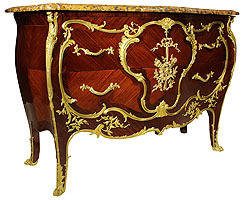 A Very Fine French Belle Époque 19th/20th Century Louis XV Style Superb Quality Ormolu Mounted Kingwood Bombé Commode with a Brêche d'Alep Marble Top, Attributed to François Linke and Mâison Millet. Unsigned. Circa: Paris, 1900. Note: The ormolu on this piece is stamped both "FL" and "EM" on the reverse. We believe that this commode was most llikely commissioned to Linke by Mâison Millet. François Linke (1855-1946) was undoubtedly the most important Parisian ébéniste of his time. Having served an apprenticeship in his hometown of Pankraz, Bohemia, Linke arrived in Paris in 1875 and set up independent workshops at 170, rue du Faubourg Saint-Antoine in 1881 and later also at 26, Place Vendôme. By the time of the Paris 1900 Exposition Universelle, Linke's worldwide reputation as a master of high individualism and inventiveness was already established and unmatched by his contemporaries. His success at the 1900 Exhibition afforded Linke a high degree of financial stability and allowed him to pursue new markets by exhibiting at subsequent international fairs. Like the inventories of contemporaries such as Beurdeley and Dasson, Linke's oeuvre included copies and adaptations of the distinct styles of 18th century important and royal French furniture. His most extravagant exhibition pieces, however, combined the Louis XV style with the new Art Nouveau style. Linke's frequent collaborator for his designs was the celebrated sculptor Léon Messagé. In 1904, he was made Officier de L'Instruction Publique, and in 1905 he was called to be a member of the Jury of the Liège exhibition. Following his stands in the St. Louis (U.S.A.) exhibition in 1904 and the Liège exhibition in 1905, Linke was decorated with the highest distinction of France, the Croix de la Légion d'Honneur, on October 11, 1906. Mâison Millet was established by Théodore Millet in 1853, and operated until 1902 from premises at 11, Rue Jacques-Coeur, Paris before relocating to 23, Boulevard Beaumarchais. Mâison Millet was a highly regarded furniture firm that was described as producing 'meuble et bronze d'art, genre ancien et moderne.' The company won several awards in the series of exhibitions in London and Paris, such as the gold medal in the 1889 Paris Exposition Universelle, a Grand Prix in 1900 and three further diplomes d'honneur and four médailles d'or for the furniture they produced. 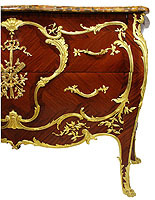 The firm specialized in the Louis XV and XVI styles, though they were acclaimed by their contemporaries for working in their own modern style. In March 1902, the firm was authorized by the Palais de Versailles to replicate Marie-Antoinette's celebrated Grand cabinet à bijoux. An auction was held in 1906 clearing the remaining stock and the firm finally ceased trading in 1918. Mâison Millet was an active client of François Linke.